520 left in stock, Hurry! Can you feel the love tonight? If not, slip on our Double Dangle Heart belly ring and start to feel it! 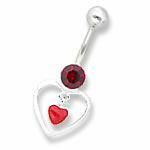 The red-jeweled bottom ball holds on to an open heart dangle. Inside the large heart hangs a smaller red-jeweled heart. Handmade with the finest materials, this ring is a perfect accessory for Valentines Day.